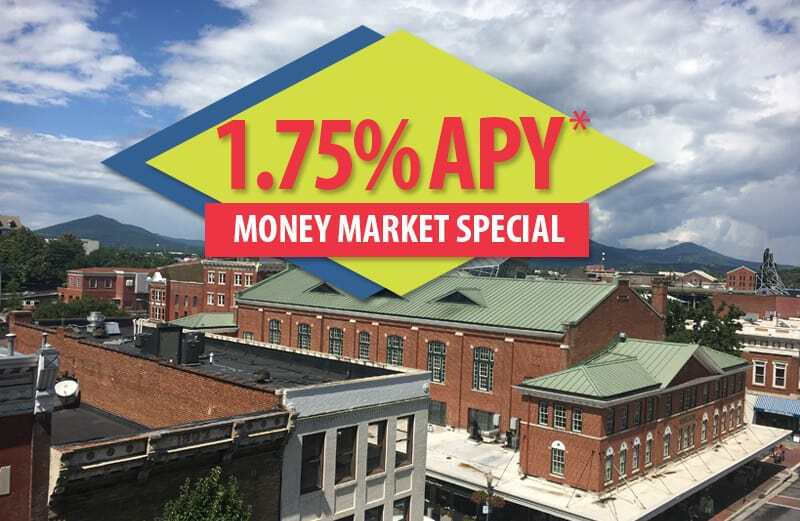 For a limited time you can avail of a special rate of 1.75% APY* on balances of $10,000 up to $1,000,000 with our Money Market SPECIAL. Open an Account & Start Saving Today! Not yet a Freedom First member? Join Us! Call us or visit a branch today to ask for this special rate before it ends: 540-389-0244 (local), 866-389-0244 (toll-free). *1.75% Annual Percentage Yield (APY) as of 9/17/2018 with a minimum balance of $10,000 to obtain APY. To be eligible for this special APY, at least $10,000 must come from sources other than Freedom First accounts. Balances below $10,000 or above $1,000,000 will earn regular Money Market dividend rates and APYs that are subject to change. Offer available to consumer accounts only. This APY is valid for 12 months from time of account opening. Beginning with the 13th month the account will continue earning dividends at the then prevailing money market dividend rate and APY. This Annual Percentage Yield (APY) may be discontinued at any time. Fees could reduce earnings on the account. Other locally competitive rates are also available. Want to Know the Differences Between Various Kinds of Savings Accounts? Freedom First savings accounts come with lower than average fees. We believe in returning profits to our members and communities. *Check our Rates for minimum deposit amounts and interest tiers. **Your savings are federally insured to at least $250,000 and backed by the full faith and credit of the National Credit Union Administration, a United States Government Agency. Because we put your interests first. Because we are headquartered and operate locally, so we build relationships with our members and are invested in your success. We have a Certificate Special! Take advantage of our great rates today. New Checking Accounts that pay YOU! Invest smart. Earn more. Explore your options with our financial calculators. Calculate how a 401k can help you create a secure retirement. Examine the benefits of investing in a series of Certificates of Deposits with different maturities. Find out how much interest you can earn on a Certificate of Deposit. Determine your net worth and estimate how it could grow over the next 10 years. See how much you could save for retirement with a Roth IRA. See how much you could save for retirement with a Traditional IRA.